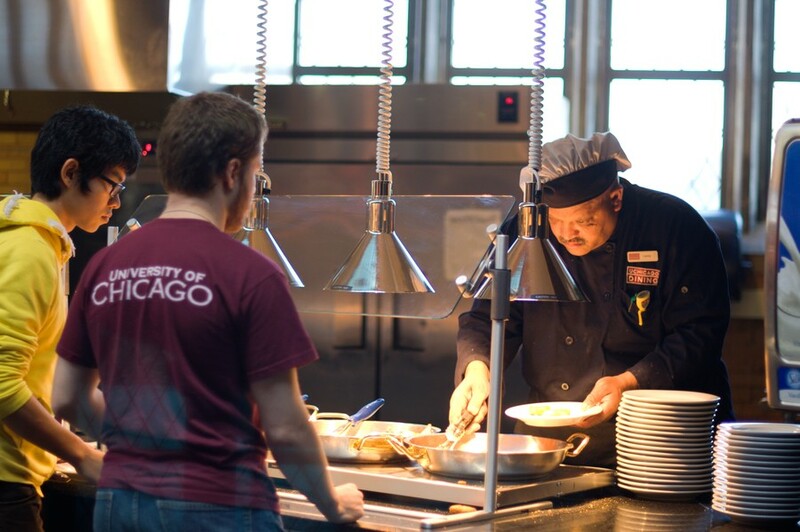 After years of collaboration with the Muslim Students Association, UChicago Dining Services has created permanent halal stations in two dining halls and expanded food options for students with dietary restrictions. Beginning this quarter, both Bartlett and Cathey Dining Commons now permanently offer daily halal offerings for students. Until last year, halal options rotated between dining halls each week. Last fall, dining halls began dedicating an entire station to halal food for the first time during the week, but had no halal offerings on weekends. The expansion of the halal program has largely grown out of a collaboration between UChicago Dining and the Muslim Students Association (MSA) over the last five years. Fourth-year Saalika Mela, one of several MSA students who helped UChicago Dining gauge the dietary needs of Muslim students on campus, said that students wanted more variety in halal offerings. “We wanted healthy food options for Muslims, such that we could have grilled chicken and greens and not always have to resort to fries or cheese pizza,” she said. Halal food must be prepared according to tenets of Islamic law, including specific guidelines for slaughter. Halal meat also cannot come into contact with other foods restricted by the Qur’an, such as pork. According to Richard Mason, executive director of UChicago Dining, figuring out how to provide halal foods in the dining halls was mainly a case of finding places to procure halal meat and ensuring that it did not come into contact with foods that would contaminate it according to the halal laws. Since the dining halls already adhere to kosher, vegetarian, and vegan dietary requirements, which are also concerned with contamination, offering halal food was not an entirely new concept, Mason said. The collaboration between dining officials and MSA that produced more halal offerings began around Ramadan five years ago. Mason said that at the time, the dining halls offered no halal options. “During the course of that work, it became clear that there were additional needs that they had for halal offerings. At that particular time, we didn’t have any halal program, so we worked with the MSA to figure out what we could do and what they were looking for,” Mason said. According to a University statement announcing the improvements last week, Mason also took UChicago Dining chefs to different neighborhoods to sample different recipes to increase the diversity of halal offerings. As halal offerings increased, Mela and other MSA students served as an intermediary between Muslim students and dining administrators. “The students have been educators and great to cooperate with. They have kept feedback very frequent and let us know when we are going in the right direction. They’ve given us recipes and been real problem-solvers,” he said. Third-year and MSA member Mohamad Kodaimati said that the increased offerings made students with dietary restrictions more comfortable in the dining halls.